Indiana wines performed well in the 2017 Indy International Wine Competition at Purdue University. Nearly 2000 wines were entered from 11 countries and 40 states were considered, according to the competition’s website. The competition has become something of a measuring stick for Hoosier winemakers as they stack up their product against other states not named California, Oregon, or Washington. Wines do come into the competition from the big three but not in significant numbers. The competition, hosted by Purdue, does have Indiana categories as well as national award winners. Many Indiana wineries scored multiple medals from the 50 judges from across the country. You can go online to look up the wins for your favorite Hoosier winery. With Vintage Indiana in downtown Indy tomorrow (June 3), I checked out some top winners and whether they’ll be at Vintage this year. Country Heritage wines scored big. Top honors – or the Indiana Governor’s Cup – went to relative newcomer Country Heritage Winery and Vineyard, LaOtto, In., (near Fort Wayne.) 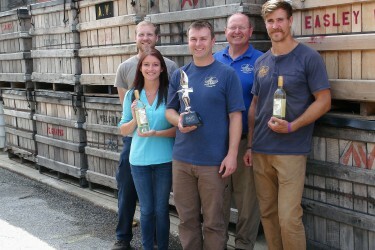 Heritage had won Indiana Farm Winery of the Year the past two competitions. Heritage won three double gold medals (top honor), 12 Golds, 15 silvers, and 12 bronze.The farm winery award is for wineries producing less than 50,000 gallons of wine annually. This year’s Farm Winery of the Year was Buck Creek Winery, just south of Indianapolis along I-74. The Indiana Wine of the Year was won by French Lick Winery for their estate-bottled Cabernet Franc. The Indiana Traminette of the Year (the state grape) was Tonne Winery’s CF2016 vintage. Tonne is located just north of Muncie. Buck Creek won best dessert wine of the competition with its 2014 Vidal Blanc Ice Wine. Brown County won the contest’s best fruit wine with its 2016 Strawberry Wine. A few of the usual suspects did well as expected. Huber Winery, which has claimed several Governor’s Cups, won 23 medals. Oliver Winery claimed 28 awards. The competition also has a category for amateur winemakers. The amateur Wine of the Year was won by David Phillips of Sugar Creek Vineyards (just outside Crawfordsville). Phillips’ winning entry was a 2016 Chambourcin Rose’. Of those winning awards, Buck Creek and French Lick are the only two pouring at Vintage according to the Vintage website. Many Indiana wineries won multiple awards. Check out the details online. Distilled spirits like whiskey, bourbon, brandy, and more have become the rage in the adult beverage world of late. Indiana has been part of the boom with distilleries starting to pop up and more on the drawing boards. French Lick Winery is the second Hoosier winery to jump into the fray with initial releases of their Spirits of French Lick products this fall. Huber’s Orchard and Winery has been in the business for some time and built a building specifically for the distillery. Earlier this year, Ted Huber confirmed more construction is going to be needed for his booming business. French Lick is uniquely positioned to do just as well as Huber’s, a tourist destination near Louisville but with few other attractions in the area. The French Lick Winery and Distillery is just across the street from the fabulously renovated West Baden Springs and French Lick Springs Hotels. French lick also boasts a a casino, prestigious 18-hole golf course, and a water park. John and Kim Doty started small in 2008, and have grown, with the wine lineup now reaching 23. “We’ve always been customer driven with our wines,” he said. “We visit so many wineries and so many wineries are guilty of making wines the winemaker or owner likes. You go to distilleries you see the same thing. Doty was able to hire a master distiller Alan Bishop who hopes to see the product line expand to fully occupy the 18,000 square feet set aside for the distillery. 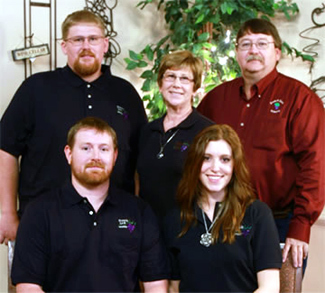 The Doty family is growing some of the grain and plans to grow even more. What they can’t grow they plan to source locally whenever possible. During a late summer visit the vodka was on the winery shelves while other products were tasted for a VIP preview event. The winery plans an Oct. 15 grand opening for the Spirits of French Lick . FRENCH LICK, IN. – Learning about wine means spending time in the vineyard. The next best thing is talking with the men and women worrying about rainfall, leaf canopy, and sugars in hot August fields. The Indiana Uplands, nine southern Indiana wineries in the state’s only AVA, held its annual Uncork the Uplands tasting event the last weekend in July at the fabulous French Lick Springs Hotel. Muck like plants, flowers or an herb garden in many Hoosier backyards, the 2016 growing season has been a strong one. “This year everything is growing, growing, and growing,” said Bernie Parker, vineyard manager for the 55-acre Creekbend Vineyard of Oliver Winery. “We’ve been applying some fungicides because of the wet weather. We’ve had more than eight inches of rain in July and we normally have half that. Traminette being delivered to Huber winery in 2014. The whites come first. That’s really good news for the Oliver operation. Late frost cut the 2014 Creekbend crop by 70 percent and the 2015 crop by about 30 percent. Doty’s 8-acre vineyard is actually in Martin County on family property on the hillside of one of the highest points in the area. The vineyard suffered some trunk damage to Chambourcin vines and lost a planting of Tannat over the past two years with the early chill but 2016 appears to be delivering a stellar crop. Butler Winery also benefit from location during bad weather years. Butler sits atop a hill just north of Bloomington. Jim Butler said his 6 acre vineyard is better suited to withstand a late frost because of its elevated position. Times have been good in recent years for most Hoosier wineries despite the two years of frost damage in a few areas. Wine sales across the country continue to rise and Indiana wine quality continues to improve. Winemakers across the state are now at a point where they’re ready to push the envelope and try new grapes. Butler is experimenting with the cold-climate Marquette. Doty and others are planting the hardy Norton grape. Ted Huber, in the state’s southern-most region, continues his work with traditional Bordeaux-style varietals. A warm and dry late summer will apparently deliver one of the best crops of recent vintages for Hoosier wine drinkers. Indiana’s top wine event is unquestionably Vintage Indiana held in Indianapolis in early June each year. Vintage Indiana brings 30-plus Hoosier wineries to Military Park in Indianapolis and gives thousands an opportunity to sample hundreds of Indiana wines. Unfortunately, the event was nearly drowned out this year with a day of heavy downpours. (Pun intended). Indiana’s second-best wine celebration might be Uncork the Uplands, Saturday, July 30, French Lick, IN. Uncork celebrates the nine wineries of the Indiana Uplands Agricultural Viticulture Area or AVA. The AVA thing is significant. The Uplands is the only AVA in Indiana. If you’re a wine drinker and like Pinot think of the Willamette Valley’s Dundee Hills, or Howell Mountain in Napa. An AVA is a federally-recognized agricultural area which produces quality grapes for quality wines. The 6th annual event runs 4-7 p.m. at the wonderful French Lick Springs Hotel. Last-minute tickets are $60. Wine fans can find a lot more information on the official website uncorktheuplands.com Unfortunately, getting a hotel room in French Lick on this summer weekend might be tough. The two resorts are sold out. But there are other small chain hotels nearby. The event features wines from all nine wineries. Visitors have the chance to talk to winemakers and winery owners. Past Uncork events featured plenty of small bites of food and even entertainment. The 2016 early evening wine tasting is the first not to be held at Oliver or Huber wineries. French Lick is a great location, though a bit of an effort to get there in the Hoosier heartland. French Lick Winery will become something of an official/unofficial host. The Doty family has a long history with Indiana wine and the Uplands event. The French Lick Winery is using the Saturday event to introduce its new distillery. The VIP event is sold out but signals another Indiana winery entering the competitive distillery business. Ted Huber has been the real pioneer among Indiana winemakers to jump into the distilled spirits business. French Lick seems like a natural with the two fabulous, Indiana landmark hotels and a bustling casino. There is another event coming up that seems to get less attention. Indiana wineries pour their wines throughout the Indiana State Fair, 1-9 p.m., each day of the fair, Aug. 5-21. State Fair attendees, who are also wine fans, should definitely stop by the Grand Hall across from the Indiana Farmers Coliseum. The event showcases wine and Indiana beer. Attendees must be 21 to enter. Approximately half of Indiana’s wineries sell a Traminette wine. Wine lovers can find the very sweet to bone dry examples of floral wine in stores and tasting rooms from north to south. The hybrid wine grape may have won its crowning achievement in early August at Purdue University when Easley Winery’s 2014 Traminette was named the competition’s 2015 Wine of the Year. Before writing off the honor as just another ribbon or contest understand the Indy competition is one of the nation’s largest. Wines arrive from 40 states and 12 countries. More than 2,100 wines are tasted during the event. Indiana recorded 316 medals during the competition. Huber Winery, Starlight, In., was again the Governor’s Cup winner for most awards. 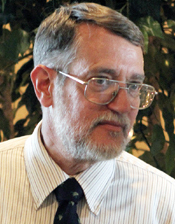 Ted Huber was the 2014 Winemaker of the Year. But others had a big showing as well. Country Heritage and Vineyards, near Fort Wayne, took home more than 20 ribbons along with the Indiana Farm Winery of the Year award. French Lick Winery won 19 awards. Turtle Run had its best showing with two ‘Best of Class” winners, two double golds, and two golds. You can find a link for all Indiana awards here. But after all the awards judges taste the best of the best and selected the Easley Traminette as the show’s best-made wine. 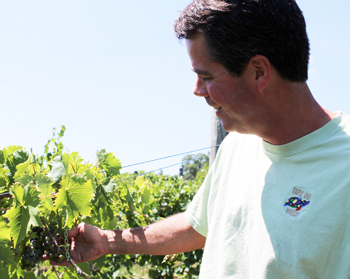 The downtown Indianapolis-based winery has been on a roll with the state’s signature grape. Ryan Robertson, cellar crew, Blake Loudermilk, grower relations, Jeff Martin, winemaker, Mark Easley, Nathan Schaefer, production manager. The 2014 wine won a gold medal at the 2015 Mid-American Wine Competition in Iowa, a double gold at the 2015 Tasters Guild International in Michigan, and a gold at the Great Lakes Great Wine competition in Michigan. Today the Traminette grapes come from four vineyards all within 300 miles of downtown Indianapolis. “All of our grapes are planted on at least two farms so that we always have grapes even in a frost year,” Easley explained. The farms are located in Harmony, Indiana, Jennings County, Berrien County, Michigan, and Yates County in New York. Ribbons and medals help sell wine. Easley’s wife Meredith heads up marketing efforts. “Wines that are presented in a tasting room with gold medals typically get tasted more often than those with a lesser medal or none at all,” she said. She explained wine drinkers realize medals come from judges with expertise and background to determine well-made wines. Meredith Easley said awards validate quality in the vineyard and winemaking. But the goal in the tasting room is to always find the wine a taster likes. The Easley name is familiar in Hoosier supermarkets like Kroger, Marsh and Mejier particularly with their Raggae line of sweet wines. Their award winning Traminette can be found in many of the same stores. In the next Grape Sense, Easley will talk about what it takes in the vineyard and winery to make his award winning Traminette. Indiana’s legislature showed a small bit of sanity in getting a shipping law passed for Hoosier Wineries before closing the most recent session. Governor Pence signed the bill into law. Sen. Phil Boots, R-Crawfordsville, gudied the legislation removing the face-­to-­face requirement for Indiana wineries to ship wine to their customers. At one point, the licensing fee went from $100 annually to $500. That was plain and simple another case of the legislators bowing to the powerful liquor lobby, funded largely by alcohol distributors. He urged supporters to keep the foot on the gas and in the end the fee structure was set up on a graduating scale depending on production and alcohol shipped. A fair, if not arguably unnecessary, solution. Kim Doty, standing center, with husband John and family. Indiana wineries could not be happier. “When the law requiring an initial face to face transaction became effective, it literally destroyed our shipments to wine customers,” said Kim Doty, owner of French Lick Winery. Again, that face­-to-­face requirement was added to legislation in 2008 as a token to the alcohol lobby but crippling, in particular, to small wineries. The new law requires age verification but all shipping laws generally do. Wineries can meet the requirement by using an age verification delivery service like FedEx or UPS. Jim Butler, Butler Vineyards near Bloomington, has long been one of the industries leading spokespersons and advocate for sanity in wine shipping laws and more. Sanity? That seldom happens with the legislature and liquor laws. Just look at what happened this year with Sunday sales. A simple law was mangled with requirements that would have retailers build walls in existing stores to sell alcohol on Sundays. Fortunately, the legislature got it right for Indiana wineries, big and small, in 2015. Michigan has long been known for its apples, cherries, blueberries and more. Indiana has raspberries, blackberries, and peaches, and more. Winemakers have been turning those fruits to wines for decades. While fruit wine often gets the cold shoulder from snooty wine drinkers, those wines remain some of the best sellers throughout the Midwest. But what do you do for dinner if your wine rack only has fruit wine choices? It’s just a matter of experimentation and perhaps a little direction from others. And if you like sweet wines just use a dose of logic – like pairing a cranberry wine with poultry. Another classic pairing is raspberry wine with just about anything chocolate. The sweetness level of the wine will set the bar for sweet, semi-sweet, or a robust dark chocolate dessert. Of course raspberry wine makes a great reduction to use with chocolate desserts, cheesecake and other sweets. Generally, wine drinkers will think of a sweeter Riesling or Gewürztraminer for spicy Asian food. Why not try a peach wine with a spicy pairing? You might be surprised how well it complements big strong flavors. You can always fall back to grape wines and pair a semi-sweet, Midwestern Traminette. Huber Winery, with Indiana’s biggest vineyard and acres more of fruit and vegetables, makes Peach, Strawberry, Apple, and Blackberry wines. Another wonderful pairing is just about any fruit wine with a salad. It’s simple, just think of your ingredients and if you’d add the fresh fruit to the salad or not. Add the fruit wine as a complement instead of the fresh berries or fruit. Ten Uplands wineries will pour wine beside artisan food businesses at 6-9 p.m., July 27, at the Bloomington/Monroe County Convention Center. The Indiana Uplands grape growing designation (AVA) was awarded by the federal government earlier this year. The designation adds authenticity to a region for growing grapes and producing wines unique to the geographic area. The Uplands group is capitalizing by moving its young event from near Louisville to Bloomington. The evening features 10 wineries: Best Vineyards, Brown County, Butler Winery, Carousel, French Lick, Huber, Owen Valley, Oliver, Turtle Run and Winzerwald. A few of the food vendors include: Fair Oaks Farm, Piccoli Dolci, Peacetree Mountain Truffles, Yours Truly Foods , Maple Leaf Farms, Smoking Goose Meats, Inga’s Popcorn, and Steckler Grassfed (beef). Judy Schad, Capriole Farmstead Goat Cheeses, will be one of the featured speakers. Jim Butler, Butler Winery, will talk about the significance of the AVA designation. A silent auction will be held to benefit the Local Growers Guild, and three chefs will compete in a wine/food pairing competition judged by all visitors. Bill Oliver, Oliver Winery, is opening his Creekbend Vineyard to visitors as part of the Uncork event. Winemakers from many of the 10 wineries will be in the vineyard Saturday afternoon to talk about grapes grown in Indiana and their winemaking. Tickets for the evening event are $55, which includes tasting at all of the winery and food tables. The combined evening program and Creekbend Tour is $75. Tickets are available at the Convention Center box office and any of the 10 wineries. For the winemakers, 2013 has been a very good year. 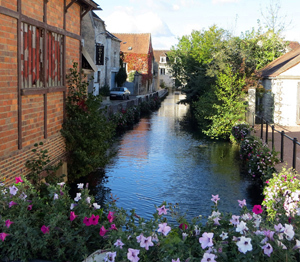 The American Viticulture Area designation provides legitimacy to wine enthusiasts. 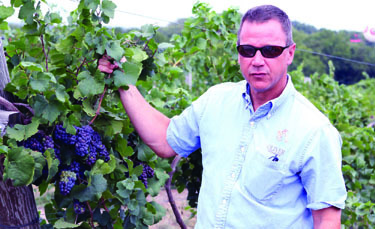 Pfeiffer in his vineyard neary Corydon. “It’s all about validity,” said Jim Pfeiffer, winemaker and owner of Turtle Run Winery, Corydon. “When you have big events people take notice. I’m a big subscriber to Robert Mondavi’s mantra of promote yourself, promote your industry and get others to grow with you. The wine trail has benefited from the publicity. Already this year, the Uplands added a 10th winery after the AVA announcement, Owen Valley Winery, Spencer, IN. Pfeiffer said the wine trail brings more credibility to each winery’s effort. “Would anyone know of Napa Valley if there were 1-2-3 wineries? You have to partner up with people who are like minded. It creates validity and excitement.